Martian Reminder of a Pioneering Flight. Names related to the first solo nonstop flight across the Atlantic have been informally assigned to a crater NASA’s Opportunity Mars rover is studying. This false-color view of the “Spirit of St. Louis Crater” and the “Lindbergh Mound” inside it comes from Opportunity’s panoramic camera. Image Credit: NASA/JPL-Caltech/Cornell Univ./Arizona State Univ. The science team leading NASA’s long-lived Opportunity rover mission is honoring the pioneering solo nonstop trans-Atlantic flight of aviator Charles Lindbergh by assigning key features of the Mars mountain top crater area the rover is now exploring with names related to the historic flight. Opportunity is now studying an elongated crater called “Spirit of St. Louis” and an unparalleled rock spire within the crater called “Lindbergh Mound” which are named in honor of Lindbergh himself and his plane – the Spirit of Saint Louis. “Spirit of Saint Louis” crater is quite special in many ways related not just to history but also to science and exploration – that very reasons behind Lindbergh’s flight and Opportunity’s astounding mission to the Red Planet. 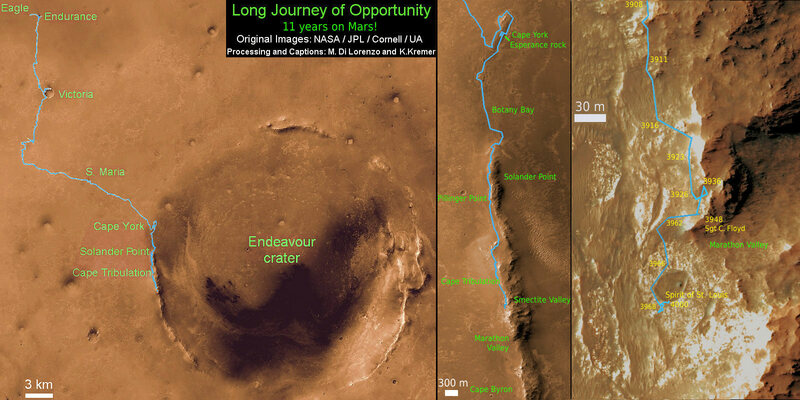 The team is ecstatic that the 11 year old rover Opportunity has reached “Spirit of St. Louis Crater” because its serves as the gateway to the alien terrain of “Marathon Valley” holding caches of water altered minerals that formed under environmental conditions conducive to support Martian microbial life forms, if they ever existed. The crater, rock spire and several features in and near it are shown in several recent panoramic mosaics, above and below, created by the rover team and separately by the image processing team of Ken Kremer and Marco Di Lorenzo. Marathon Valley and Spirit of St. Louis Crater are located just a few hundred meters south of a Mars mountain summit at a majestic spot called Cape Tribulation. It lies along a marvelous ridgeline along the western rim of Endeavour crater, which spans some 22 kilometers (14 miles) in diameter. “What’s the connection between St. Louis and the Spirit of St. Louis? Lindbergh flew from New York to Paris, but he named his aircraft for the St. Louis citizens who purchased it for him,” says Prof. Ray Arvidson, the rover Deputy Principal Investigator of Washington University in St. Louis. The raw images for the mosaics were taken in March and April 2015 using the robots mast mounted pancam and navcam cameras. The mosaics are shown in false color and colorized versions, annotated and unannotated. Charles Lindbergh embarked in May 1927 on his history making flight from New York to Paris in the airplane he named Spirit of St. Louis, the first solo nonstop flight across the Atlantic. The shallow Spirit of St. Louis Crater is about 110 feet (34 meters) long and about 80 feet (24 meters) wide, with a floor slightly darker than surrounding terrain, says NASA. Lindbergh Mound dominates the crater measuring about 7 to 10 feet (2 to 3 meters) tall, rising higher than the crater’s rim. The annotations also include features named to recognize the financial backing for the flight from St. Louis residents including Harold M. Bixby and Harry M. Knight. The plane’s designer was Donald A. Hall. Among other features named are Roosevelt Field, the spot on New York’s Long Island from which Lindbergh took off, and Marathon Monument, where the rover completed a her first marathon distance runners drive on Mars. The team picked a distinctive outcrop, Marathon Monument, to mark the finish line, said NASA officials. “The science team for the rover picks crater names from a list of “vessels of exploration,” including ships of sail and spacecraft as well as aircraft. As long as the rover remains in the crater, names for interesting features will drawn from a list of names related to this famous flight,” according to a NASA statement.